Famous Polish mathematicians were professors at the Lwów University before WWII, such as Stefan Banach and Hugo Steinhaus. I have my Aunt's university booklets from Lwów, with signatures of Steinhaus and Banach. When she graduated, she was teaching mathematics in Przemyśl. Thank you Fantom for your previous translation. 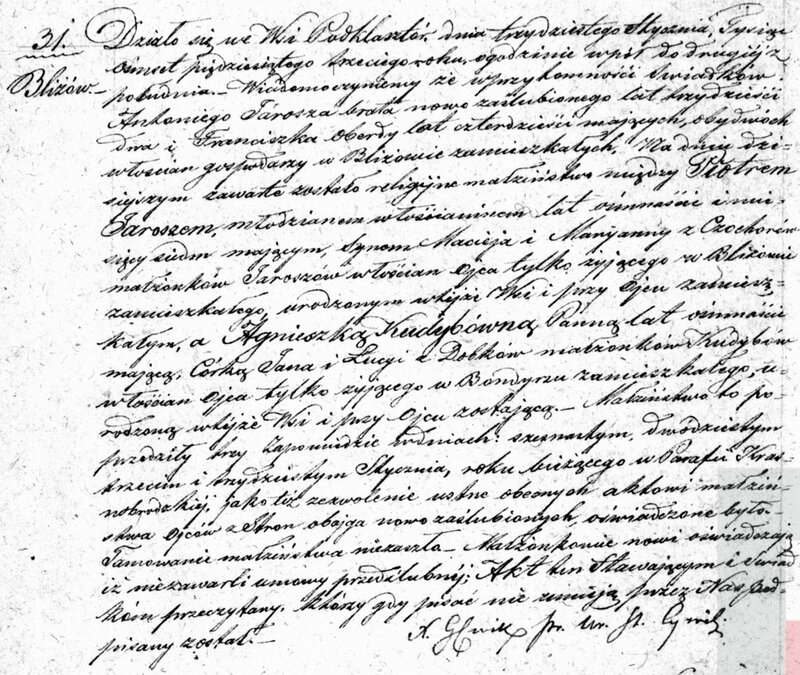 Could you please also translate the attached death record for my great great grandfather, Stanislaw Chrzanowski, book entry #40, 1854 Osowka? 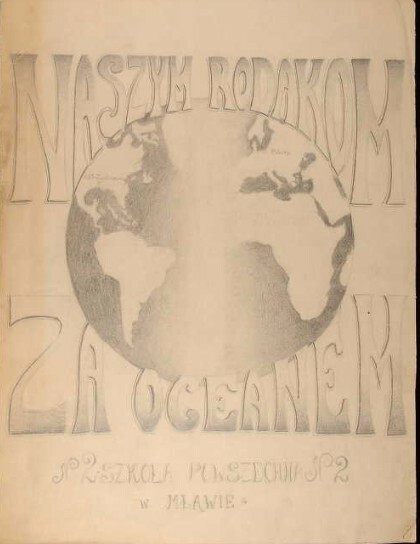 If it is possible, could you please include a typed version of the record in Polish? 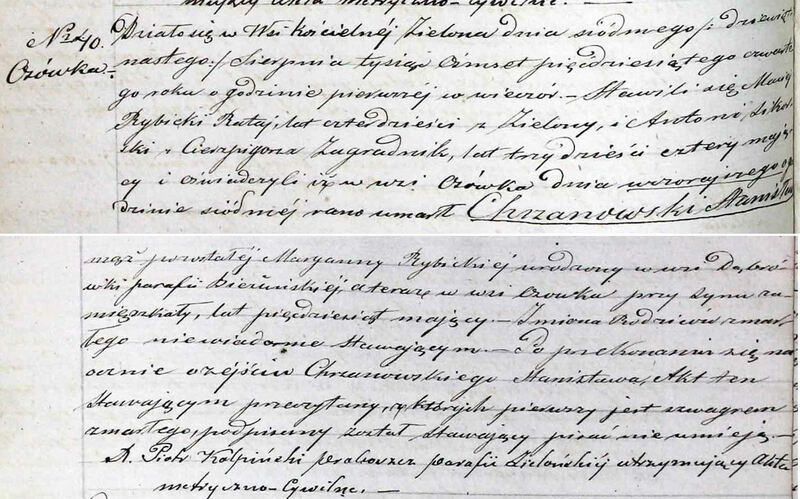 This greatly helps me to match and understand the cursive script in the record. P.S. In your previous reply you mentioned that Osówka is located at 52° 54′ 56″ N, 18° 58′ 37″ E. However, I believe the Osówka of my ancestors is located at 53° 7'0.12"N, 19°55'38.25"E because this is near to Zielona parish and other towns in my ancestry. Do you agree? I am starting to follow backward from my great grandfather Michael David Eiswald to his grandfather, Bogumil Eiswald. I found Bogumil's death record. His wife was Anna Mejer. I could not make out the rest. 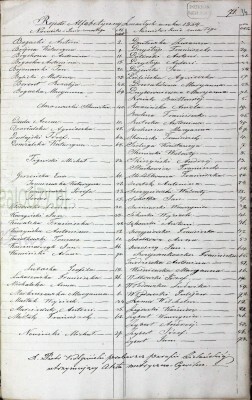 I would love to have this death record translated. Although your post didn’t end up where Gilberto suggested here is a translation of the important data without the verbose standard formulae of such records. Hope this provides what you need. NOTE: Szkoła Powszechna => Common School, the one which gives the initial common education to everyone, in France it is called Elementary School, in Polish it is like "Commons"
Thank you so much for the translations of the three pages I posted. It looks like many schools created thank you cards and wishes for an American school or schools all on the same occasion. It looks like my namesake/probable relative Regina Podjazd was probably a pupil at Common School No. 2 in Mlawa. no. 25 is probably located at 53° 7'0.12"N, 19°55'38.25"E. This is because the parish priest who signed it seems to be Piotr Kolpinski from the nearby Zielona (53.090312 N, 19.961628 E). 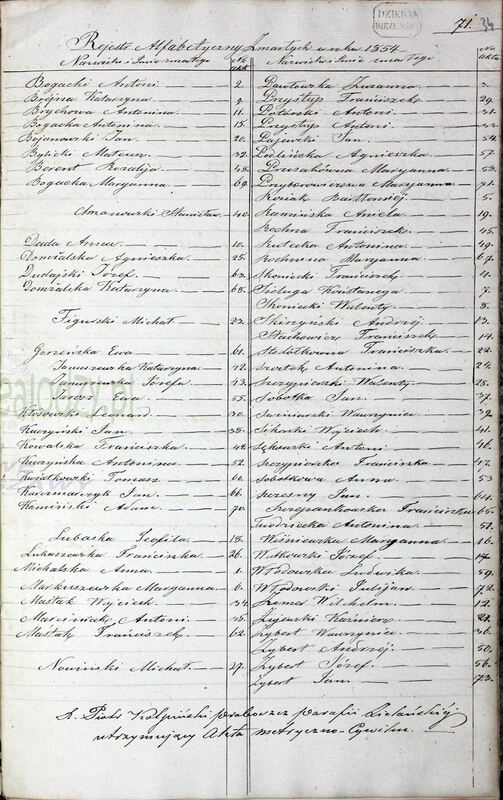 I have translated this birth record myself but I am having difficulty reading this male child's name probably due to the handwriting. 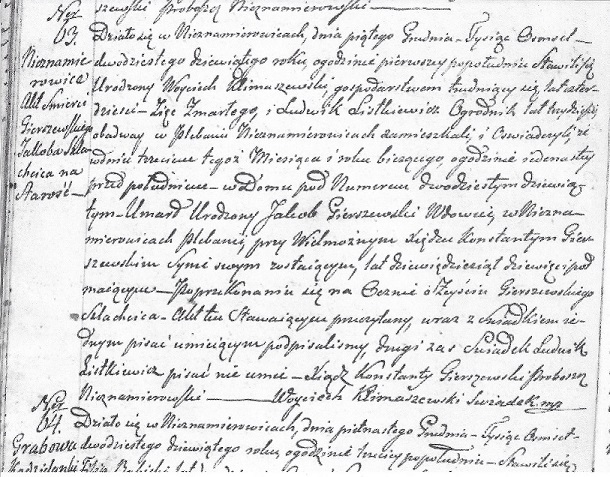 My best guess is Majer Balus (surname: Gruchalski) but I cannot find either of these names on any Polish name list. I would appreciate anyone's help. Thank you. 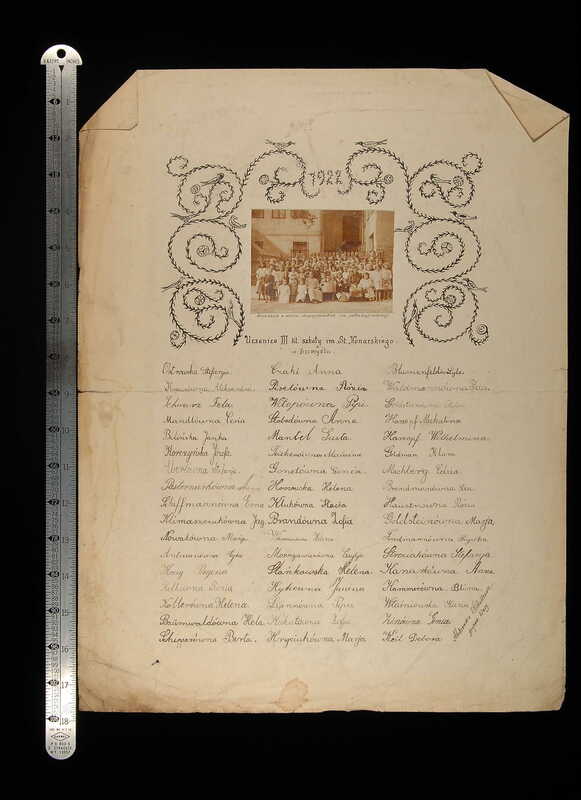 I just discoverd even a bigger card and wishes to America: in 1926, Poland sent America a birthday card signed by one-sixth of its population! Dzialo sie w Nieznamierowicach, dnia 5 grudnia 1829 roku, o godzinie 1 po poludniu. Stawili sie urodzony Woyciech Klimaszewski, gospodarstwem trudniacy sie, lat 40, ziec zmarlego, i Ludwik Listkiewicz, ogrodnik lat 30, obydwaj w Plebanii Nieznamirowicach zamieszkali, i oswiadczyli, ze w dniu 3 tegoz miesiaca i roku biezacego, o godzinie 11 przed poludniem, w domu pod numerem 29, umarl urodzony Jakob Gierszewski, wdowiec w Nieznamierowicach Plebanii, przy Wielmoznym Xiedzu Konstantym Gierszewskim, synie swym zostajacym, lat 99 majacym. Po przekonaniu sie naocznie o zejsciu Gierszewskiego Szlachcica. Akt ten stawajacym przeczytany, wraz z swiadkiem jednym pisac umiejacym podpisalismy, drugi zas swiadek Ludwik Listkiewicz pisac nie umie. 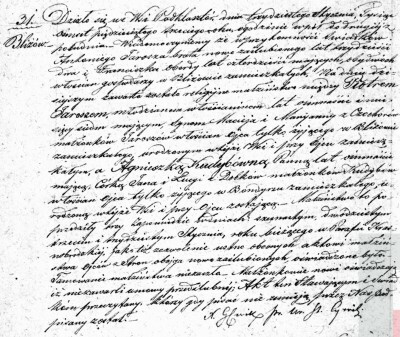 It happened in Nieznamierowice, on 5 December 1829 at 1 pm. Appeared in well-born Woyciech Klimaszewski, occupation farmer, 40 years old, son in law of the deceased, and Ludwik Listkiewicz, gardener, 30 years old, both residing in the Rectory in Nieznamirowice, and declared that on the day 3 of the current month and year, at 11 o’clock before noon, in the house at number 29, died well-born Jakob Gierszewski, widower, residing in the Rectory in Nieznamierowice, staying with Honorable Priest Konstanty Gierszewski, his son, 99 years years old. After visual conviction that Nobleman Gierszewski passed away. 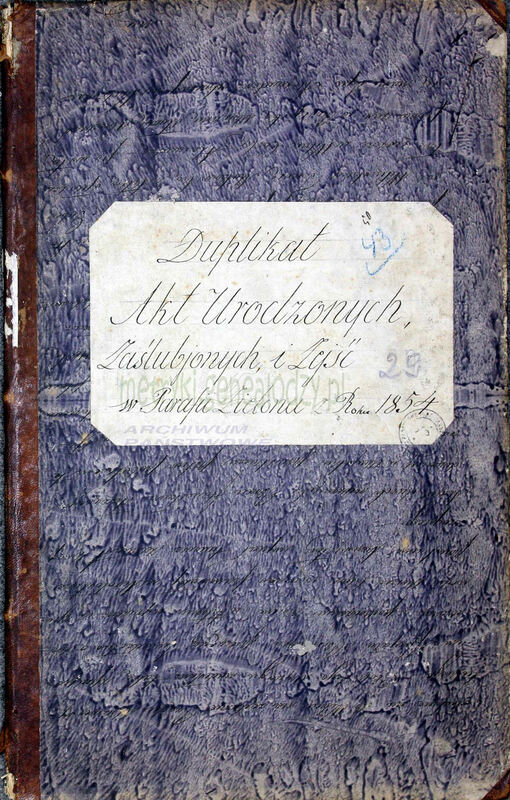 This act was read to the present, along with the first witness, who knew how to write, we signed, while the second witness Ludwik Listkiewicz does not know how to write. Signature: Woyciech Klimaszewski, witness "mp"
Wow - that is something! And on the 4th of July! 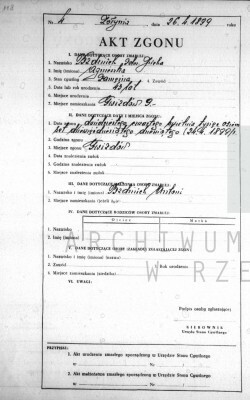 Would greatly appreciate a translation of the attached death record. I can make out most everything other than the writing following the surname, line #3, and the cause of death information. "As long as we are remembered, we remain alive." I like translation the marriage of Piotr Jarosz and Agnieszka Kudyba. As usual, I'm really struggling with the these and would greatly appreciate a translation, whenever time permits. 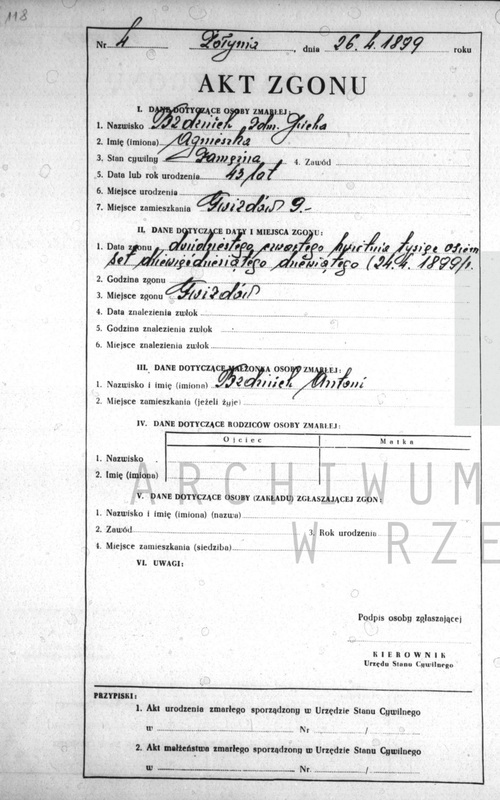 Name and age of the deceased: Wawryniec Bzdziuch age 3. There is no field in this certificate for specifying cause of death. Bride: Agnieszka Kudyba age 18 years, maiden, born and residing in Bondyrz. Her parents: Jan Kudyba and Łucja Dobek. Mother is deceased. 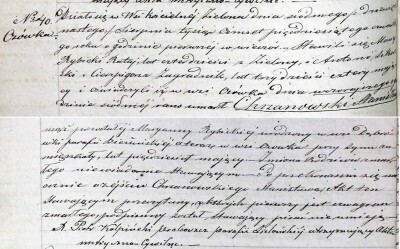 (Note: In Agnieszka’s birth certificate of 18 January 1835 her mother is also recorded as Łucja Dobek).